: This breed originated from medium-sized dogs that existed in Japan in the ancient times. It became established as a breed in the Kai district (Yamanashi Prefecture), which is surrounded by mountains. 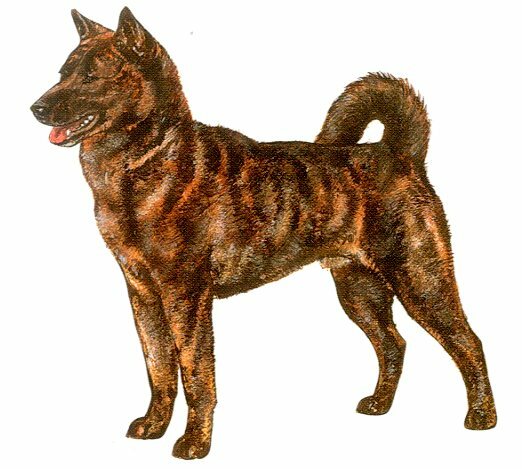 Another name for this breed is « Kai tora-ken ». A distinguishing feature in this dog is its brindled coat. These dogs are used mainly for hunting wild boar and deer. Their strong inclination to form a pack is thought to contribute towards maintaining the purity of the breed. The breed was designated as a « natural monument » in 1934.
: Medium-sized dog, well balanced, sturdily built, muscles well developed. The dog has the characteristics of a dog living in mountainous districts of Japan. Limbs strong and hocks remarkably developed. : The temperament is keen and very alert. : Abrupt with slight furrow. : Black, nasal bridge straight. : Pointed, not very long, but moderately thick. : Strong with a scissor bite. : Relatively small, nearly triangular and dark brown in colour. : Slightly larger than those of other medium-sized Japanese dogs, triangular, slightly inclining forward and firmly pricked. : Thick, powerful and muscular. : Deep, ribs moderately sprung. : Set on high, thick, vigorously curled or carried curved like a sickle over the back. Tip nearly reaching the hocks when let down. : Straight, heavy and muscular. : Toes well arched and tightly knit; pads thick and elastic; nails hard and preferably dark in colour. : Outer coat harsh and straight; undercoat soft and dense. The hair on the tail is fairly long and off-standing. : Black brindle, red brindle and brindle. As a feature of this breed, solid colour in puppyhood may turn brindle as the dog grows. Coat with many white spots.